DETROIT -- Ford Motor Co. today said its profit fell 56 percent in 2014 as it introduced 24 vehicles around the world, including the new Mondeo in Europe. Ford posted net income of $3.2 billion, down from $7.2 billion in 2013. It earned $52 million in the fourth quarter, marking its 22nd consecutive profitable quarter, but that was down from $3 billion in the same period a year earlier, when results were boosted by favorable tax benefits. Ford said it would keep relying on North America for its profit this year as it signaled that losses in Europe would be more than previously forecast. Ford had previously estimated losses from Europe at about $250 million in 2015. On Thursday, however, it backed away from that forecast, saying the loss would narrow from $1 billion in 2014 but would be wider than previously thought. "We're seeing a much bigger impact from Russia," Chief Financial Officer Bob Shanks said. In Europe, Ford’s losses narrowed to $443 million in the fourth quarter, down from $559 million during the last quarter of 2013, and $1.1 billion on the year, down from $1.4 billion in 2013. Ford's Russian operations contributed to its European troubles as the automaker was hit last year by a $348 million loss in the country, where lower oil prices and a weak ruble are expected to lead to continued economic woes. Annual revenue was down 2 percent, to $144.1 billion, as Ford booked fewer trucks and other vehicles coming off the assembly line. The fourth-quarter results included a previously disclosed $800 million pretax charge related to currency devaluation in Venezuela. Excluding that and other special items, including costs related to job cuts in Europe, where Ford shut a car production factory, and Asia Pacific, the automaker earned a quarterly operating profit of $1.1 billion, 15 percent less than a year ago. In North America, Ford earned $6.9 billion last year, 22 percent less than it did in 2013. As a result, about 50,000 hourly UAW members at Ford will receive profit-sharing checks averaging $6,900. Last year’s profit-sharing checks averaged $8,800, a record. The payouts, to be made in March, will total about $345 million. As production and sales of the vehicles introduced in 2014 ramp up, Ford said it expects to earn a 2015 pretax profit of $8.5 billion to $9.5 billion, which matches the guidance it provided in September. Ford sales slipped 1 percent in the U.S. last year, with its share falling to 14.9 percent from 15.9 percent at the end of 2013. Executives have attributed the decline to the F-150 production changeover, though other nameplates also underperformed their segments. 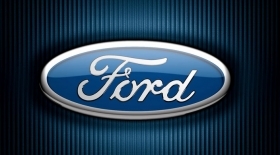 Ford retained its ranking as Europe's No. 2-selling brand after Volkswagen with a 2014 volume of 947,951 vehicles, an increase of 5 percent, according to industry association ACEA. The full-year results, equal to $1.16 a share, were slightly above Wall Street’s expectation of $1.11. The fourth quarter was Ford’s fifth consecutive quarter of positive automotive operating cash flow. Its Asia Pacific region achieved a record $589 million operating profit for the year.